As millennials become the primary buyers in the housing market, the world of shopping for a home online is getting more competitive. They need high-quality visuals to keep them interested. Real estate agents see the value in using virtual staging instead of regular home staging. With 90% of buyers looking online first when house shopping, the image is important. In fact, it is widely agreed that staged homes sell faster than non-staged homes. Virtual home staging has become an agent’s best friend. Continue reading to learn why virtual staging for realtors is gaining more popularity. Virtually staging a listing allows you to avoid the hassle of hiring movers to haul staging furniture into the house. It also lets you avoid spending hours setting up and staging all that furniture. If your listing is in a high-rise apartment, imagine the headache and frustration you save by using virtual furniture instead of the real thing. Vacant homes can be attractive to burglars. They have even been known to look on real estate listing websites for homes that are vacant. Expensive home staging furniture might seem like an easy score. Likewise, staging a home with traditional furnishings that still has occupants, is taking a risk that they might damage the furniture. Virtual furniture is a secure way of staging a home without the risk. Traditional home staging is expensive. In most cases, it’s worth it. But let’s face it, not everyone can afford $2,000 to $5,000 for a typical vacant home staging. Then, there are monthly fees after that if it doesn’t sell quickly. 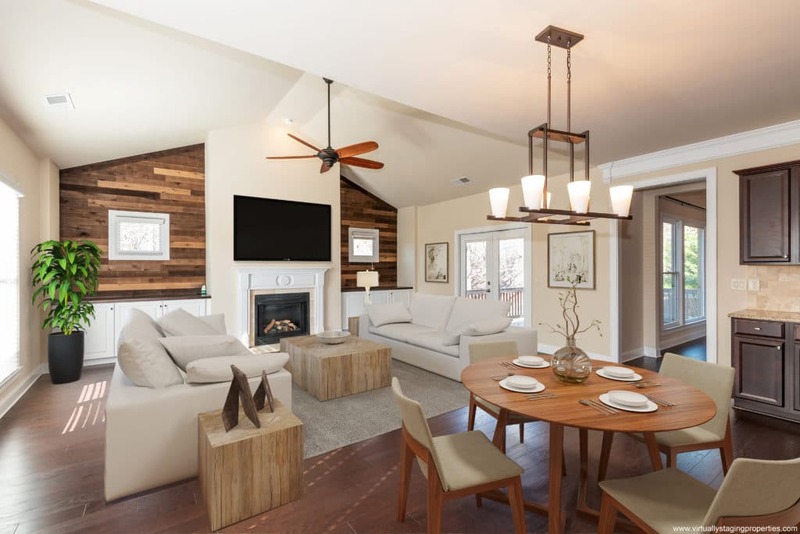 With virtual staging, there are two ways to approach it: Go the least expensive route or hire a professional virtual home staging company with years of experience actually staging homes. Beware of a low-cost provider because the old adage “you get what you pay for” applies far more often in life than you might want to believe. Think about your own business…do you approach your clients and sell them on being the lowest cost agent? Absolutely not. You sell them on your experience and the value that you bring to the table as a result. Beware: If the people doing your virtual staging have never really staged a home before, or are located on the other side of the world, this could be a bad sign. You could hire a professional, experienced virtual home staging company with years of actual staging experience. They, as stagers also do, will take into account the type of buyers you are marketing the home toward. They will use their knowledge of design and current design trends to make sure that your listing attracts the broadest audience possible. Remember, houses that are staged sell faster. And, the quicker the agent sells the home, the happier their clients will be!